Digital content and communications strategist. My perspective on life has been undergoing some changes since August 2017. My best friend from high school suddenly passed away. Sagar leaving this world was a devastating loss to everyone who was lucky to know him and it rattled me to the very core of my being. A year later there are days when facing this reality still hits me hard. It usually creeps up in the quietest and rather simple moments, like looking out the car window as my mom drives me to the train station, hearing a song we used to listen to while carpooling in high school or just walking alone in New York City. And other seemingly-random-but-not-at-all triggers, like seeing literally any Hyundai Sonata ever; he used to drive a teal one. As for me, I've lost count of the number of weeks that I have experienced struggling to get out of bed each morning, feeling weighed down by the dread that would begin to hover from the night before. Think “Sunday scaries” except it being every single day scaries. I give an excruciating level of consideration to what I am willing to share on social media (working professionally in social media will do that to you). After a lot of thought, I feel it is time to share this broadly with you - my friends, former colleagues, friends of friends, acquaintances, and whoever you may be, however you got to reading this. Without revealing all the finer details, after 6 specific weeks of contemplating how much more I could endure or what the heck more I could possibly do on my side to try and make things better at work, I decided (with a lot of fear in my heart, but an abundance of support from my now husband) to quit my job back in May - with nothing else lined up. For those of you who know my personality, this just “isn't me." I'm a type A planner. I never thought I would ever make such a decision without having the next step, and the one after that, already mapped out well in advance. Never say never. If you know me then you also know that I throw myself into my work - I care about doing a stellar job and I’ve always worked really freaking hard, to the point where friends call me "the workaholic" (I'd rather be "the beauty guru," but hey) and at one of my previous companies I became one of the youngest people with a VP title at age 27. It turns out that this year, I learned the hard way that I was taking care of everything and everyone that I needed to at work - but in and out of the office I wasn't taking care of myself the way I needed to. Quitting my job was scary. I was afraid of being judged, having regrets and throwing away a workplace rank I worked so hard to attain that I would not be able to get back. But every single time I felt miserable at work or merely just thinking about it, my thoughts automatically would start to shift to Sagar, to his passion for life and to the meaning of making the most of every moment. Remembering him helped me to finally make the decision I had been so fearful of but was the right one for my health. I owed it to myself and my family to take some time off to reset. After all, work will always be there. My last day was only 9 days before my wedding, exactly four months ago. I soaked up every minute I could in that period, totally engrossed in catching up on details of wedding planning that sadly were neglected when I was working. 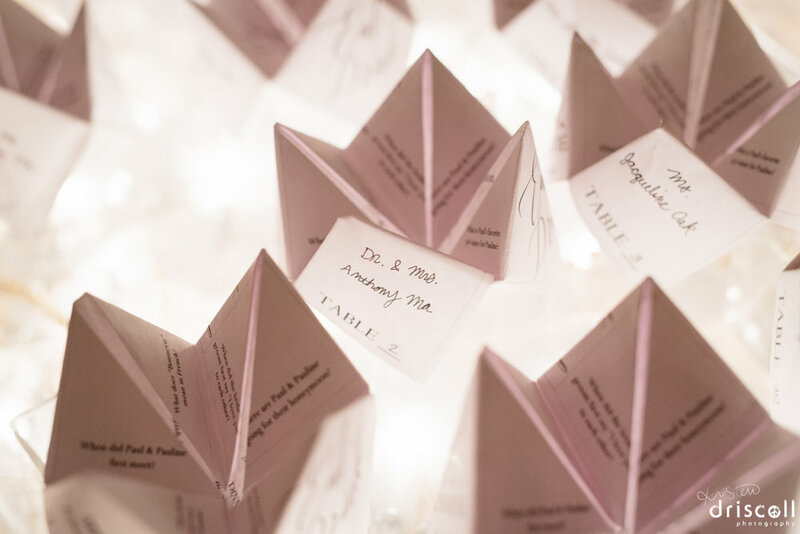 It was a joy and I am SO PROUD (caps for serious emphasis) for allowing myself to have this time; I folded hundreds of things by hand from our favor boxes to the fortune tellers that served as our guests' place cards. I assembled every single thing that went into our hotel gift bags (including writing all of the cards that went inside them by hand... perhaps could have done without that part, looking back on it! ), and I created all of our framed table numbers that showed photos of us at each corresponding age. Paul and I always wanted the details of our wedding day to be very personal to us and true to who we are; I am really grateful I put myself in a position to help make it happen and grateful to Paul for his unwavering support of my uncharacteristic decision to take a break from working life. I am grateful for a lot of things, but among them absolutely worth mentioning: having my finances in order to allow for all of this to be possible and for having an inner circle of the most loving family and friends who are my lifelong cheerleaders… and who genuinely share in my excitement for what’s next. So… here I am. Thank you and congratulations for reading to the end of this first post on my namesake blog, or whatever you want to call it. I'm not making any overzealous declarations of what it is going to be. All I know is first and foremost, it's for me - for me to share more of myself with the people who care. And in daring to do so, I hope to hold myself accountable to the philosophy of living life with more focused intention and passion. I hope Sagar would be proud.